Previously I wrote about network elements and interfaces between them, now it's time to write about most important thing in a mobile network, from operator's side. How to charge customers for the fact they are using mobiles to many activities, including web surfing. Today I'm going to present some informations about Online Charging System (OCS), how does it work, its call flow basics scenarios, and last but not least basic principles. As always is good to know about what we will be talking about, so please have a look at high level architecture concept of online charging. Ro is reference point from the Charging Trigger Function (CTF) to the Charging Data Function (CDF) and the Online Charging Function (OCF) respectively, and are intended for the transport of charging events. Ro reference point is equivalent to Gy interface. BD: Billing Domain. This may also be a billing mediation device / post-processing system. Each Charging Trigger Function (CTF) would have Charging Data Function (CDF) and Online Charging Function address list to which it can send its charging events and/or charging requests. List is organized hierarchically. If the primary charging function is not available (e.g., out of service) then the CTF shall send the chargind information to secondary charging function and so on. Each CDF in PLMN may know other CDF's network addresses (e.g., for redundancy reasons, to be able to recommend another CDF address with the "Redirection Request" message). Worth remembering is that each network element that generates charging information will send the information only to the charging entities of the same PLMN, and not to charging entities in other PLMNs. Online charging for both events and sessions between CTF and the OCF is performed using the Gy interface. It supports integrity protection and authentication for the case that the CTF is outside the operator domain. Online charging has two sub-functions that require a more detailed description: rating and unit determination. Both of them, can be implemented centralized (i.e., on the OCF), or decentralized (i.e., on the CTF). Second of them, unit determination refers to the calculation of the number of non-monetary units (service units, data volume, time and events) that shall be assigned prior to starting service delivery. With Centralized Unit Determination, the OCF determines the number of non-monetary units that a certain service user can consume based on a service identifier recived from the CTF. With Decentralized Unit Determination approach, the CTF determines itself how many units are required to start service delivery, and requests there units from the OCF. After checking the service user's account balance, the OCF returns the numbers of granted non-monetary units(based on account balance) to the CTF. The CTF is then responsible for the supervision of service delivery. Particularly, the CTF shall limit service delivery to the corresponding number of granted units. 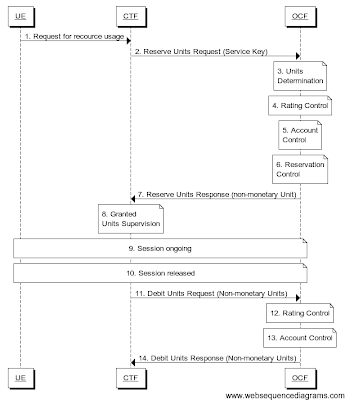 Rating refers to calculation of piece out of the non-monetary units calculated by the unit determination function. With the Centralized Rating approach, the CTF and the OCF exchange information about non-monetary units. The OCF translates these units into monetary units. Witch the Decentralized Rating approach, the corresponding rating control is performed within the CTF. Consequently, CTF and OCF exchange information about monetary units. For further information about those please check TS 32.240 3GPP documentation. To perform IEC, ECUR and SCUR cases via Gy interface, scenarios between UE, OCF and CTF need to be defined. Scenarios will be shown in details below. Careful reader will notice there is lack of "Centralized Unit Determination & Decentralized Rating" case. That is why such combination is not possible. In following scenario, CTF asks the OCF to assign a defined number of units. 2. Units Determination: depending on the requested service the CTF determines the number of units accordingly. 3. 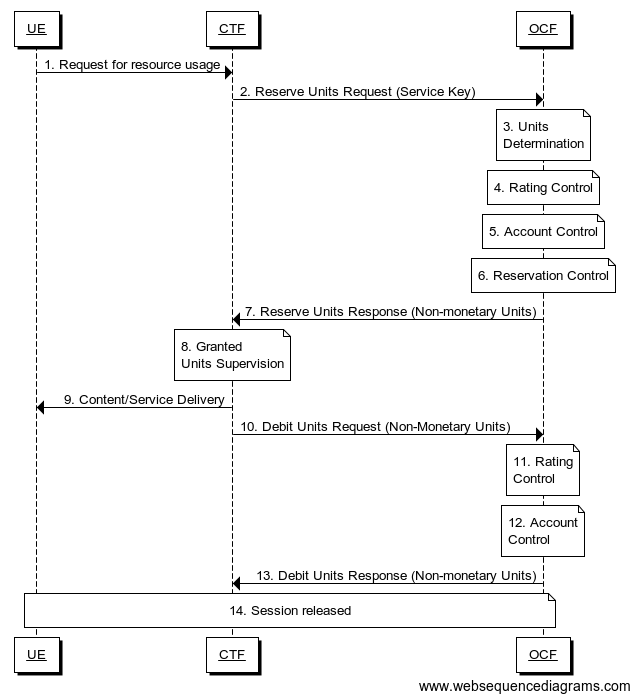 Debit Units Request: the CTF requests the OCF to assign the defined number of units. 4. 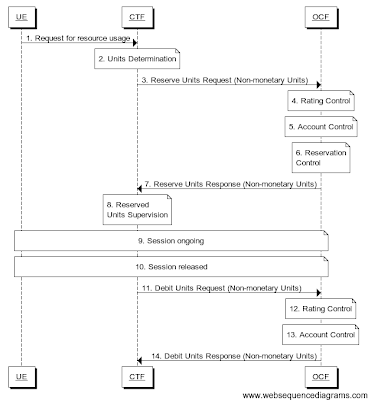 Rating Control: assisted by the rating entity the OCF calculates the number of monetary units that represents the price for the number of units determined in item 2. 5. Account Control: provided that the user's credit balance is sufficient, the OCF triggers the deduction of the calculated amount from the subscriber's account. 6. Debit Units Response: the OCF informs the CTF of the number of granted units. 7. 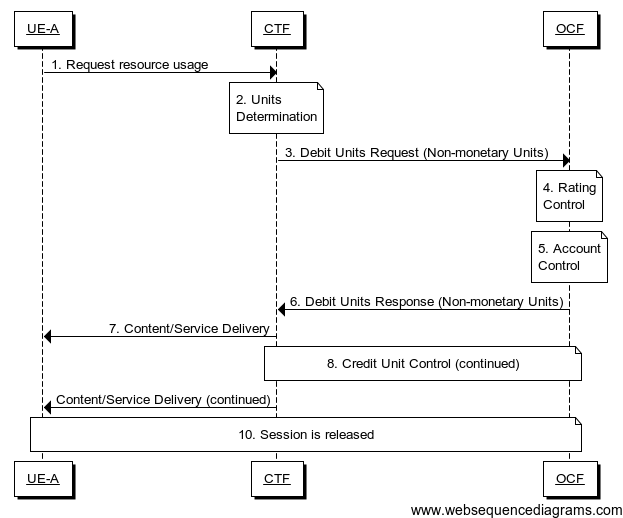 Content/Service Delivery: the CTF delivers the content/service at once, in fractions or in individually chargeable items, corresponding to the number of granted units. 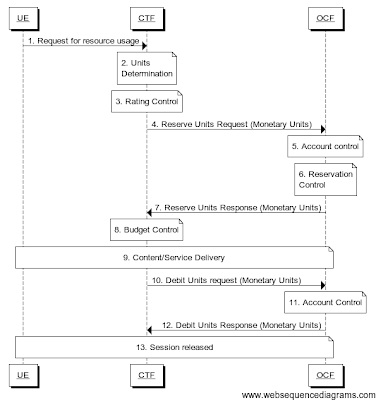 8. Credit Unit Control (cont. ): this function block is optional and a replication of items 2 to 6. 9. Content/Service Delivery (cont. ): the continuation of content delivery occurs in correspondence with the occurrence of item 8. 10. Session released: Session is released. In following scenario, CTF asks the OCF to assign units based on the service identifier specified by the CTF. 1. Request for resource usage: The UE-A requests the desired resource or content from the network element. 2. Debit Units Request: depending on the service requested by the UE-A, the CTF selects the service identifier and forwards the Debit Units Request to the OCF. 3. 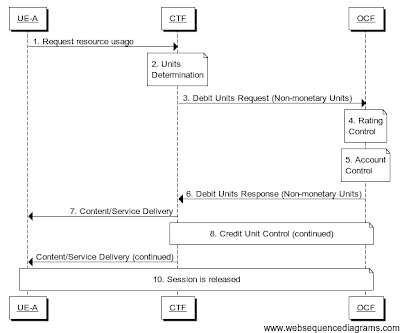 Units Determination: the OCF determines the number of non-monetary units needed for the content/service delivery, based on the received service key. 4. 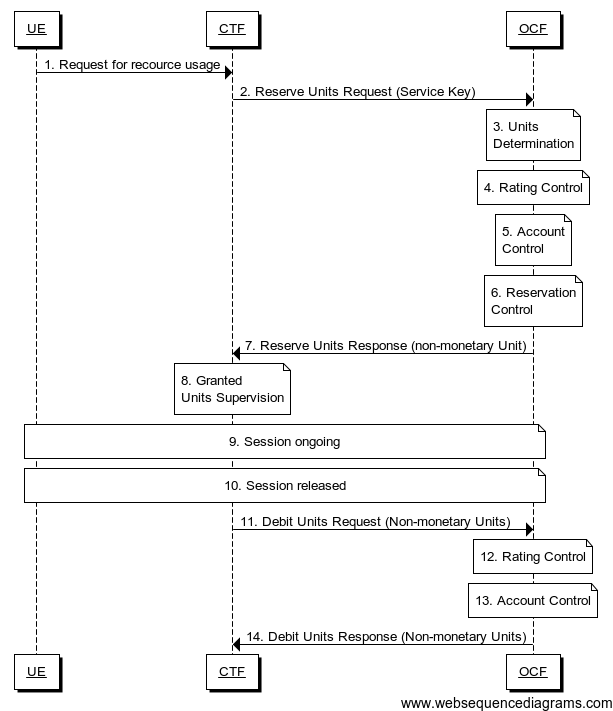 Rating Control: assisted by the rating entity the OCF calculates the number of monetary units that represent the price for the number of units determined in item 3. 6. Debit Units Response: the OCF informs the CTF of the number of granted units. This includes the case where the number of units granted indicates the permission to render the service that was identified by the received service key. 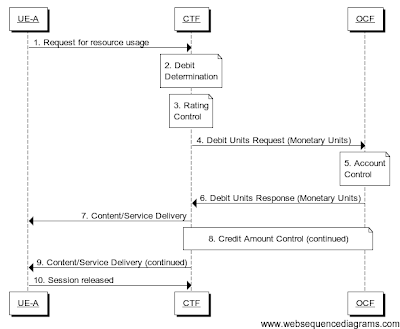 8. Credit Service Control (cont. ): this function block is optional and a replication of items 2 to 6. In the following scenario, the CTF asks the OCF to assure the deduction of an amount of the specified number of the monetary units from the subscriber's account. 1. Request for resource usage: The UE-A requests the desired content from the network element. 2. Units Determination: depending on the service requested by the UE-A, the CTF determines the number of units accordingly. 3. Rating Control: the CTF calculates the number of monetary units that represent the price for the number of units determined in item 2. 4. Debit Units Request: the CTF requests the OCF to assure the deduction of an amount corresponding to the calculated number of monetary units from the subscriber's account. 6. Debit Units Response: the OCF indicates to the CTF the number of deducted monetary units. 7. 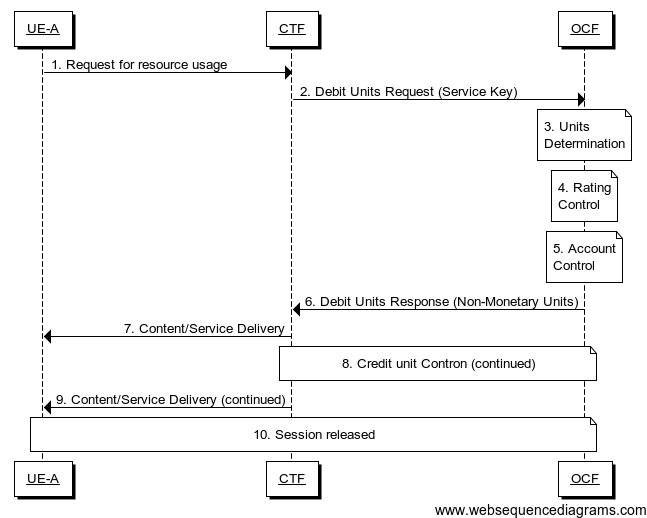 Content/Service Delivery: the CTF delivers the content/service at once, in fractions or in individually chargeable items, corresponding to the number of units as specified in items 2 and 3. 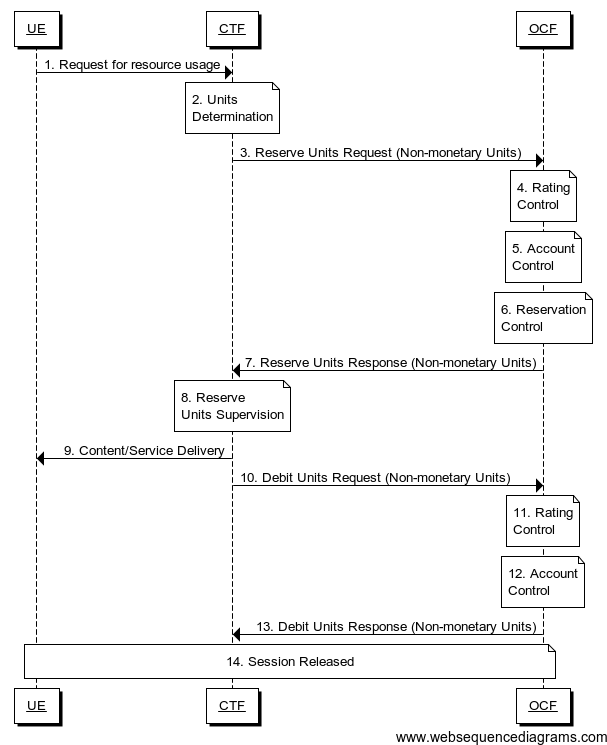 8. Credit Amount Control (cont. ): this function block is optional and a replication of items 2 to 6. 10. Session released: the session is released. In addition to the flows that are specified in the previous subclauses, the Debit Unit operation may alternatively be carried out concurrently with service delivery, or after completion of service delivery. In the following scenario, the CTF requests the reservation of units prior to service delivery. An account debit operation is carried out following the conclusion of service delivery. 1. Request for resource usage: The UE-A requests the desired content/service from the NE. 3. Reserve Units Request: the CTF requests the OCF to reserve the number of units determined in item 2. 5. 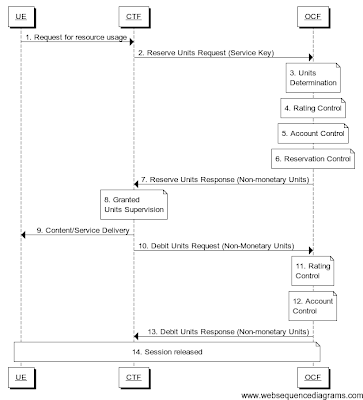 Account Control: the OCF checks whether the user's account balance is sufficient for the requested reservation. 6. 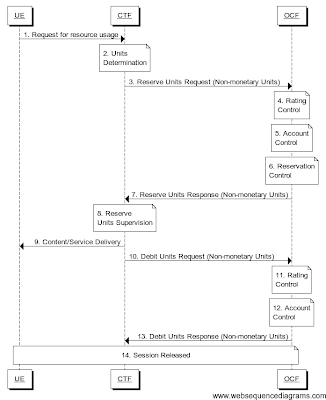 Reservation Control: if the user's account balance is sufficient then the corresponding reservation is made. 7. Reserve Units Response: the OCF informs the CTF of the reserved number of units. 8. Reserved Units Supervision: simultaneously with the service delivery, the CTF monitors the consumption of the reserved units. 9. 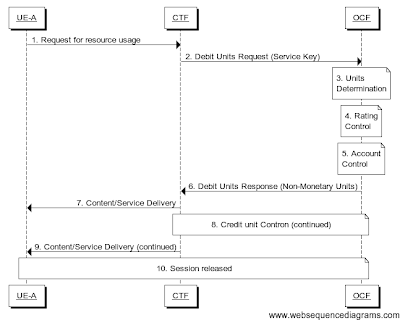 Content/Service Delivery: the CTF delivers the content/service at once, in fractions or in individually chargeable items, corresponding to the reserved number of units. 10. Debit Units Request: the CTF requests the OCF to assure the deduction of an amount corresponding to the consumed number of units from the subscriber's account. In the case that no further units are required for this service, an appropriate indication triggering the release of the remaining reservation is given. 11. Rating Control: assisted by the rating entity the OCF calculates the number of monetary units to deduct from the subscriber's account. 12. Account Control: the OCF triggers the deduction of the calculated amount from the subscriber's account. 13. Debit Units Response: the OCF informs the CTF of the actually deducted units. 14. Session Release: the session is released. In the following scenario, the CTF requests the OCF to reserve units based on the service identifier specified by the CTF. 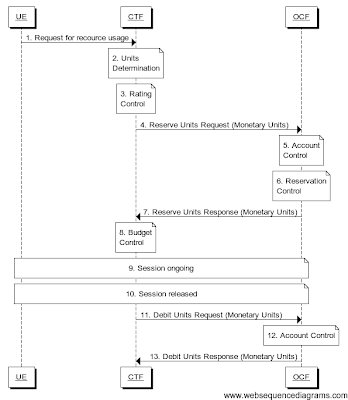 An account debit operations is carried out following the conslusion of service delivery. 1. Request for resource usage: The UE-A requests the desired content from the CTF. 2. Reserve Units Request: depending on the service requested by the UE-A, the CTF selects the service identifier and forwards the Reserve Units Request to the OCF. 6. 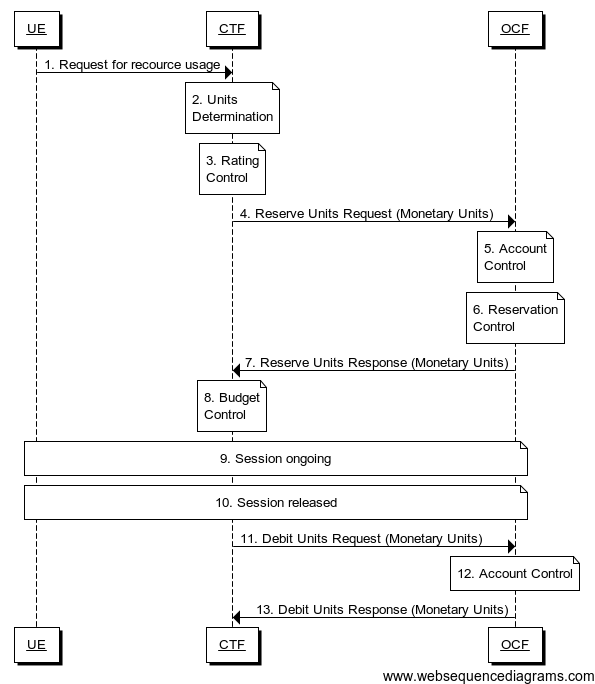 Reservation Control: if the user's account balance is sufficient, then the corresponding reservation is made. 7. Reserve Units Response: the OCF informs the CTF of the reserved number of units. This includes the case where the number of units reserved indicates the permission to render the service that was identified by the received service key. 8. Granted Units Supervision: simultaneously with the service delivery, the CTF monitors the consumption of the reserved units. 10. Debit Units Request: the CTF provides according to previous Reserve Units Response the request to deduct the amount of units corresponding to the consumed number of units. 14. Session Released: the session is released. In the following scenario, the CTF request the OCF to assure the reservation of an amount of the specified number of monetary units from subscriber's account. An account debit operation that triggers the deduction the amount from the subscriber's account is carried out following the conclusion of service delivery. 4. Reserve Units Request: the CTF requests the OCF to assure the reservation of an amount corresponding to the calculated number of monetary units from the subscriber's account. 6. 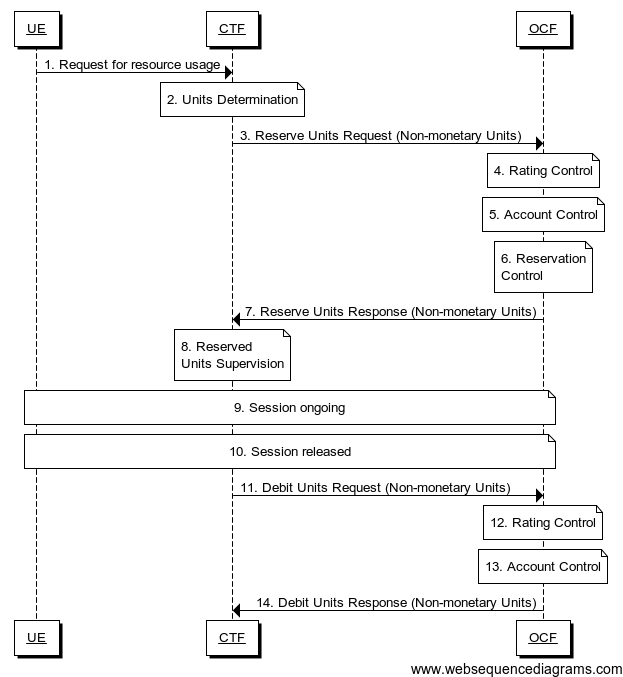 Reservation Control: if the user's credit balance is sufficient, then the corresponding reservation is made. 7. Reserve Units Response: the OCF informs the CTF of the reserved number of monetary units. 8. Budget Control: simultaneously with the service delivery, the CTF monitors the consumption of the granted amount. 9. 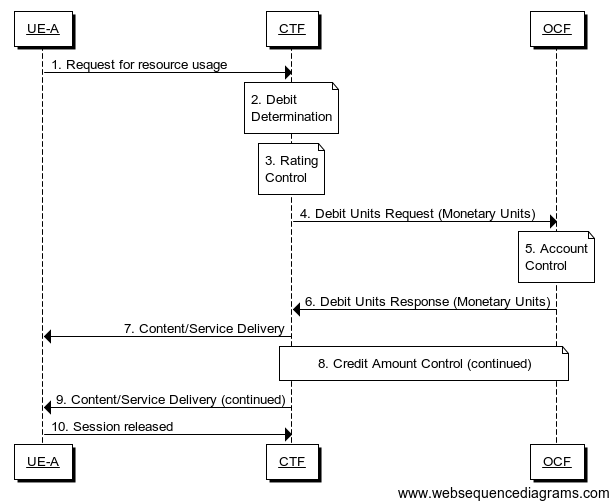 Content/Service Delivery: the CTF delivers the content/service at once, in fractions or in individually chargeable items, corresponding to the number of units. 10. Debit Units Request: the CTF requests the OCF to assure the deduction of an amount corresponding to the consumed number of monetary units from the subscriber's account. 11. Account Control: the OCF triggers the deduction of the consumed amount from the subscriber's account. 12. Debit Units Response: the OCF indicates to the CTF the number of deducted monetary units. 13. Session Released: the session is released. In following scenario, the CTF requests the reservation of units prior to session supervision. An account debit operation is carried out following the conslusion of session termination. 1. Request for resource usage: The UE-A requests session establishment from the CTF. 2. Units Determination: depending on the requested type of the session the CTF determines the number of units accordingly. 8. Reserved Units Supervision: simultaneously with the ongoing session, the CTF monitors the consumption of the reserved units. 9. Session ongoing: the CTF maintains the session. One or more debit and reserve operations may be performed when the session is ongoing. 11. Debit Units Request: the CTF requests the OCF to assure the deduction of an amount corresponding to the consumed number of units from the subscriber's account. 12. Rating Control: assisted by the rating entity the OCF calculates the number of monetary units to deduct from the subscriber's account. 13. Account Control: the OCF triggers the deduction of the calculated amount from the subscriber's account. 14. Debit Units Response: the OCF informs the CTF of the actually deducted units. In the following scenario, the CTF requests the OCF to Reserve units based on the session identifiers specified by the CTF. An account debit operation is carried out following the conclusion of session. 1. Request for resource usage: The UE-A requests the session establishment from the CTF. 2. Reserve Units Request: depending on the requested type of the session by the UE-A, the CTF selects the service identifier and forwards the Reserve Units Request to the OCF. 8. Granted Units Supervision: simultaneously with the ongoing session, the CTF monitors the consumption of the reserved units. In the following scenario, the CTF request the OCF to assure the reservation of an amount of the specified number of monetary units from the subscriber's account. An account debit operation that triggers the deduction the amount from the subscriber's account is carried out following the conclusion of session establishment. 2. Units Determination: depending on the requested type of the session by the UE-A, the CTF determines the number of units accordingly. 8. Budget Control: simultaneously with the ongoing session, the CTF monitors the consumption of the granted amount. 11. Debit Units Request: the CTF requests the OCF to assure the deduction of an amount corresponding to the consumed number of monetary units from the subscriber's account. 12. Account Control: the OCF triggers the deduction of the consumed amount from the subscriber's account. 13. Debit Units Response: the OCF indicates to the CTF the number of deducted monetary units. Easy and complete documentation for good understanding. Are there any tools that could be used to generate realistic data for testing the Ro interface to OCS? I am wondering how would one test OCS without real network? How would one know what AVP's to expect for a particular call scenario? we use 8950 from ALU to test. Use seagull. it is very friendly.